Working in the pre-clinical field of regenerative medicine, you want to make your results count from the start. Take this vision literally and use optimized starting materials for a seamless transition from bench to bedside. Promising pre-clinical results are exciting and the translation into clinical studies should be doable with as little hassle as possible. However, while undeniably important and indispensable, regulatory guidelines for clinical studies can complicate this step. Therefore, it is worth spending the time to think ahead in order to choose the optimal reagents that enable a seamless transition into the clinic. With this translation in mind, Miltenyi Biotec developed culture media optimized for every step of the way – including the perfect quality grade for pre-clinical studies. To ensure reliable product performance and lot-to-lot consistency, we perform functional QC testing on every lot of our xeno-free (XF) media formulations. For example, for induced pluripotent stem (iPS) cell culture media, doubling time is measured over five passages and typical cell morphology is assessed for each passage. Furthermore, pluripotency is tested by quantitative flow cytometry using a defined combination of six markers, including surface and intracellular markers. As we know that reproducibility and deliverability are important factors in pre-clinical research, we only use unit-specific doses of in-house produced cytokines as supplements in our media production. This ensures consistent biological activity levels and prevents delivery delays of raw materials. 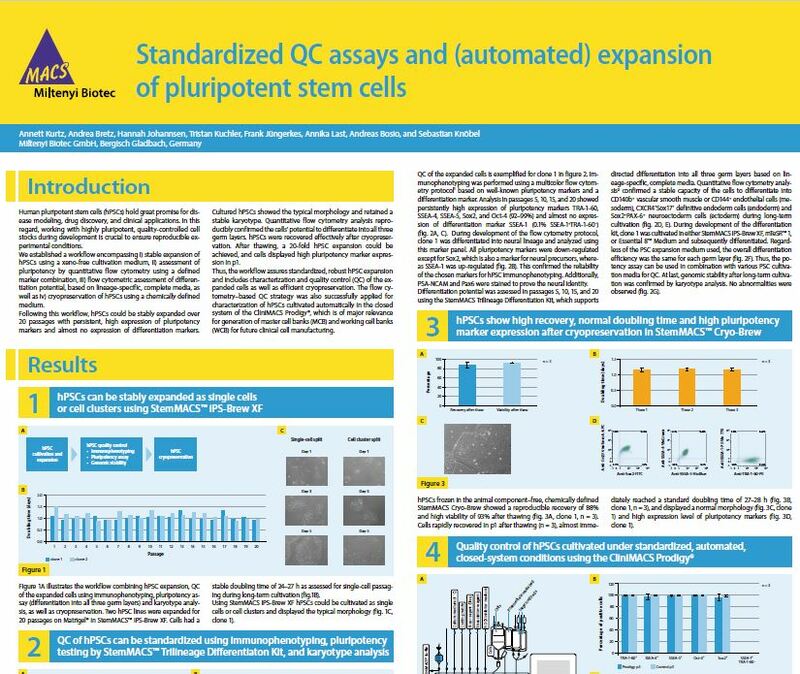 To learn more about our QC procedures download this poster presented at ISSCR 2018.